LOUISVILLE, Ky. – Wineries from Burkesville, Frankfort, and Paducah received Commissioner’s Cup honors at the Celebration of Kentucky Wines gala Saturday at the Mercury Ballroom in Louisville honoring the top wines in the third annual Kentucky Commonwealth Commercial Wine Competition. Up the Creek Winery of Burkesville took the Commissioner’s Cup for Best Boutique Wine (small production) for its 2013 Gold Rush wine. 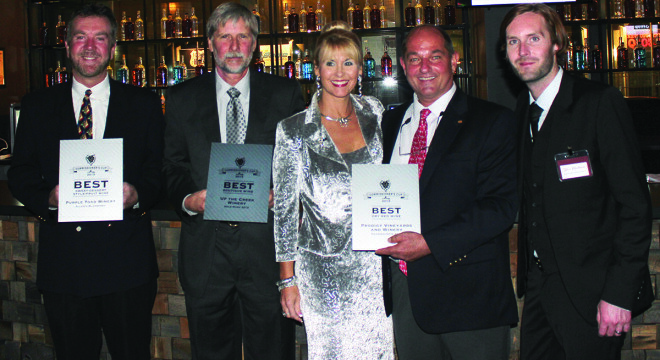 Prodigy Vineyards & Winery of Frankfort won Best Dry Red Wine for its 2009 Chambourcin. Purple Toad Winery of Paducah won Best Sweet/Dessert Style/Fruit Wine for its Allen’s Blueberry wine. Three wines earned double gold in the Kentucky Commonwealth competition – Prodigy’s 2009 Chambourcin; a Sangria from Purple Toad made from Chardonnay grapes and blackberry, peach, and strawberry; and Wight-Meyer’s 2014 Winter Solstice wine made from Diamond grapes. Purple Toad won the medal count with 26 (one double gold, five gold, 14 silver, and six bronze), followed by Wildside Winery of Versailles with 11 medals (five silver and six bronze) and Old 502 Winery of Louisville with 10 (one gold, six silver, and three bronze). Wines in the Kentucky Commonwealth competition were judged blind based on each wine’s merit by a panel of experts from throughout the nation. The competition attracted more than 140 entries from 22 wineries. The gala was emceed by Doug High, producer of two films about Kentucky’s grape and wine industry and the morning anchor for WTVQ-TV in Lexington. The Commissioner’s Cup, sponsored by the Kentucky Department of Agriculture, is the highest honor in the competition and is awarded to the top Kentucky wine of the year in each category. The Kentucky Commonwealth Commercial Wine Competition is held to identify and recognize the best wines produced in the state and to raise awareness of Kentucky’s wine industry. Tyler Madison, the Kentucky Department of Agriculture’s grape and wine program manager, said Kentucky has more than 70 wineries and some 550 acres of grape vines. Kentucky was home to the first commercial winery in the United States and was one of the leading grape- and wine-producing states in the 19th century before the industry was shuttered during Prohibition. For a full rundown of the Kentucky Commonwealth Commercial Wine Competition results, go to http://competition.kentuckywine.com/. For more information about Kentucky’s grape and wine industry, go to www.kentuckywine.com. To find a Kentucky winery near you, download the Kentucky Wine app for iOS or Android devices.